When technology stocks fall, that is the time DIYers (do-it-yourself) seeking value stocks should get interested. That was the case for Synaptics (SYNA), whose earnings failed to impress and Symantec (SYMC), whose management said it was looking into its accounting practices. Then there is Nuance Communications (NUAN). For a while, it looked as if Nuance turned the corner and would return to growth at a reasonable price. That changed in short time when the company reported second-quarter results that shook investor confidence. Revenue growth lagged in the single digits while the company slipped to a GAAP loss. A jump in cash flow from operations was the only bright spot. The company touted its progress in user-experience offerings in automotive, with Daimler and Toyota. The cloud platform continued growing through Dragon Medical cloud. 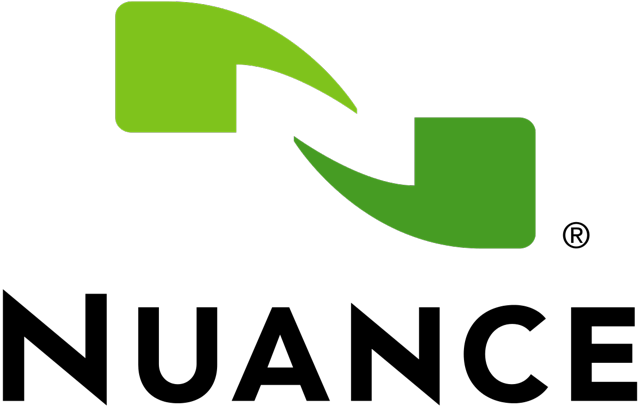 Nuance introduced AI in its core engine capabilities, offering voice recognition and text-to-speech features for the enterprise. Two other buzzwords it used include voice biometrics and virtual assistant design wins. Even though Nuance secured business from Cisco Systems (CSCO), Ford Motor (F), Geely, and Wells Fargo (WFC) for the virtual assistant, competitors are already ahead. Alphabet (GOOG) is dominating the consumer space with Google Home Assistant and Smart Speaker. Amazon.coms (AMZN) Alexa is selling in record numbers, with tens of millions in sales during the last holiday season. Healthcare and Automotive continued as prominent growth drivers in the quarter, with Healthcare delivering 8% organic revenue growth and Automotive providing 12% organic revenue growth. 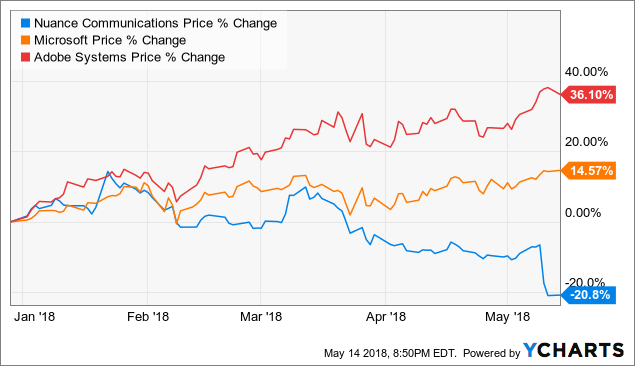 More troubling was the companys underperformance in the enterprise space, due to lower services and licensing deals getting pushed out into the next (third) quarter. Bookings also fell a significant 8 percent. Nuance forecast organic revenue will grow by just 2 percent to 4 percent. Bookings will grow 5 percent to 7 percent for the fiscal year, helped by Dragon Medical, Automotive, and Enterprise. The company is seeing significant changes in its SRS business, or Subscriber Revenue Services business. 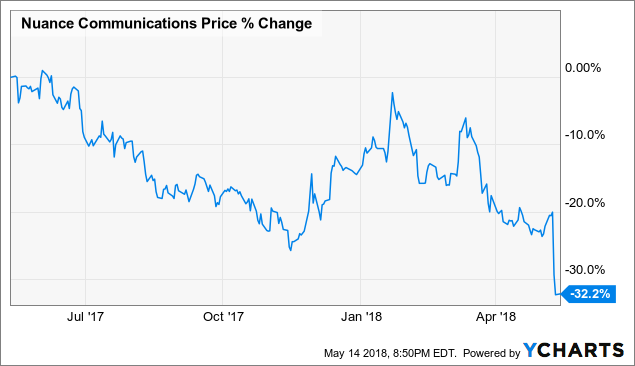 Value investors may point to the successful shift of software sales to a subscription model with Adobe Systems (ADBE) and its Creative Suite. Microsoft (MSFT) is another example of a company that successfully moved its Office users to Office 365 on the cloud, cross-selling Azure cloud computing platform and services to small businesses and enterprises. While Microsoft may earn a valuation of 24 times forward P/E and Adobe gets 32.6 times forward P/E, Nuances 11 times forward is not likely to expand any time soon. This implies the share price will not rise. The company still has a debt to maintain, with its long-term debt/equity at 1.14 times. Year-over-year, long-term debt increased from $2.24 billion to $2.3 billion. In the fiscal second quarter, cash flow worsened due to an impairment of goodwill charge of $137.9 million and higher capital expenditures of $12.78 million, up from $7.39 million. Nuance forecast cash flow from operations in the range of $410 million to $430 million. It previously guided $430 million to $450 million. Investors did not expect weakness in SRS. Margin guidance continues to fall every quarter (for three quarters in a row). Previously, Nuance faced weakness in professional services but this time, SRS became a headwind. Investments in conversational AI and security initiatives cut into profitability. The company has some hope for growth in Healthcare. EHR optimization and implementation have nice traction. Large implementations could once again offset the impact from Nuances weaker segments. This model suggests Nuance has another 10 percent in downside. Please [+]Follow me for value stocks on sale. Click on the big “follow” button beside my avatar. This DIY ideas originate from the DIY Value Investing marketplace service. This entry was posted in Best Stocks on May 16, 2018 by admin.